Around early 2012, I made some rough experiments around input and event delivery that required nothing but Glib, X and cairo. It was only a bit later, when I had a basic event delivery and rendering model, when I started thinking on how would have windowing subsystems in toolkits evolved if we had all the tools and lessons learnt that we now have. Mechane is a concise wrapper to the windowing system, with all expected modern features integrated in the core. There’s several widgets, ranging from simple to complex, exercising these features. Even though it internally has a backend abstraction, there is only a wayland implementation. The basic building block in Mechane is a MechArea, as the codebase was in principle built to check input-related concepts, it was made so elements could be reused most readily, so a micro-widget approach was taken, similar to Rapicorn. Under this approach, simple MechAreas do as little as possible, and those work as building blocks to create growingly complex composited MechAreas. There is an emphasys on using GInterfaces for the most usual data exchange with an UI, as composite areas have facilities to delegate full interfaces on child areas. This all allows for making composited areas that are fairly opaque on the outside, while the little inner pieces focus on their business. Transformations are also dealt with as a core feature, any MechArea can be assigned a transformation matrix. The coordinate space on events is fully virtualized (starting on 0,0 on the area receiving the event), there’s though ways to translate between coordinate spaces whenever needed. One can think transformations is mainly necessary for effects, scrolling is the most notable example of transformations in Mechane though. On this design, the basic MechArea that does text display/edit will be terribly ubiquitous if used as the foundation for entries, labels, text views and whatnot. As such quite some emphasis was made at having something that scales very well, and the result has gotten really nice: MechTextView can handle massive ammounts of text, letting you instantaneously scroll anywhere in the buffer , no CPU grinding happens on the background on any situation. But this all started around input! there’s a collection of gesture controllers and incipient experiments around making those cooperate across a hierarchy, there’s though interesting puzzles around grab transfers and cancellation that are still subject to investigation. This all makes a very nice result, every piece is very self-contained, in a way that many things can be reused or made to work elsewhere, eg. a “complex” widget like a scrollable view came out like a piece of cake. As for rendering performance, going through software rendering it beats comfortably the 60fps mark in most situations on now oldish laptops. In such early stages, there’s of course quite some open fronts: first and foremost is input handling, also some wayland features are still unsupported, like subsurfaces and clipboards, and the techniques used for validation-less textviews is worth investigating on icon/list views. Kudos to Kristian Høgsberg and all wayland/weston/cairo folks. I’m happy how lean the Mechane is turning out to be, but it could only be so lean thanks to their work. For the 11th consecutive time, I’m attending GUADEC! Thanks to Lanedo I’ll make it to Brno in 1.5 days. Aleksander and I will be talking about Tracker. So if you want to talk about Tracker, Mechane, GTK+ or input handling, I’ll be around, see you there! Yes, this is the second toolkit-thingy from your fellow lanedians, there must be some irony in it. Well, somewhere between 500 and 700MB of text it goes from “snappy” to “responsive” here due to other arising bottlenecks, still more text I can read without my eyelids falling off. 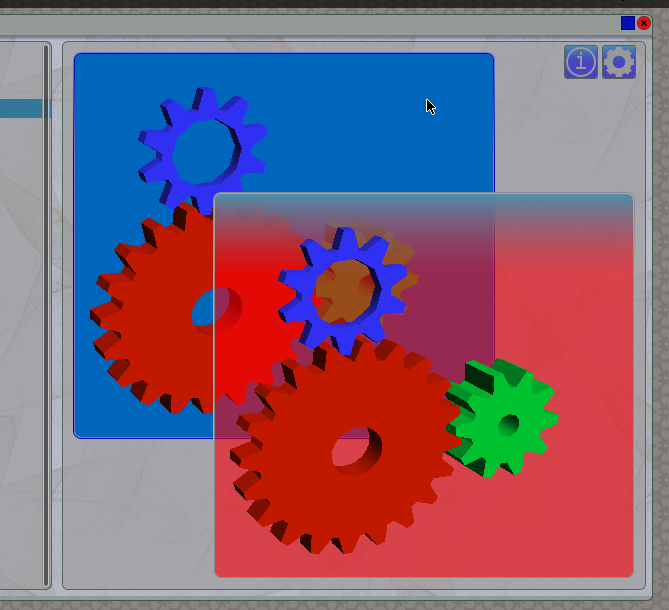 How amenable to graphical UI design (such as using a glade-like tool) do you think Mechane is? One of the problems GTK+ has had for quite a while is not really having a very good way of integrating graphical UI design helper, any potential replacements should try to address that from the ground up I think. As you could figure I guess, there’s still nothing to load UIs from description files :), Would be interesting to know how you think a toolkit could integrate better with UI design tools. One thing I had in mind, although not necessarily related, was about having the GInterfaces mentioned in the post very central about the information exchange with the UI, so you might have a “data set” specific to a dialog, and you map fields in there to elements in the UI (ie. an “user-name” property there connects to an entry, a boolean field can connect to toggles, etc). That way there’s a degree of independence between the data an application deals with and its representation.